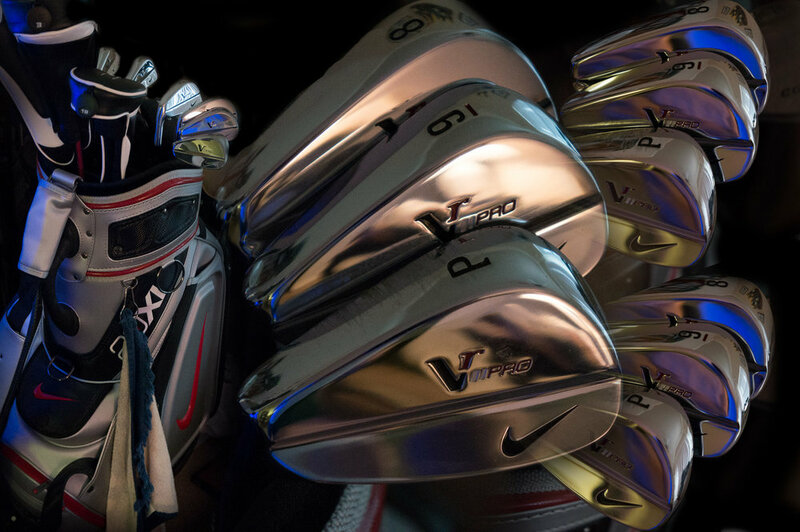 The other day, I was bored, and I decided on a impromptu product shot of my new golf clubs. I decided to challenge myself and only use my camera, and only a single bounce flash, and any ordinary household items I could find to use as props .. 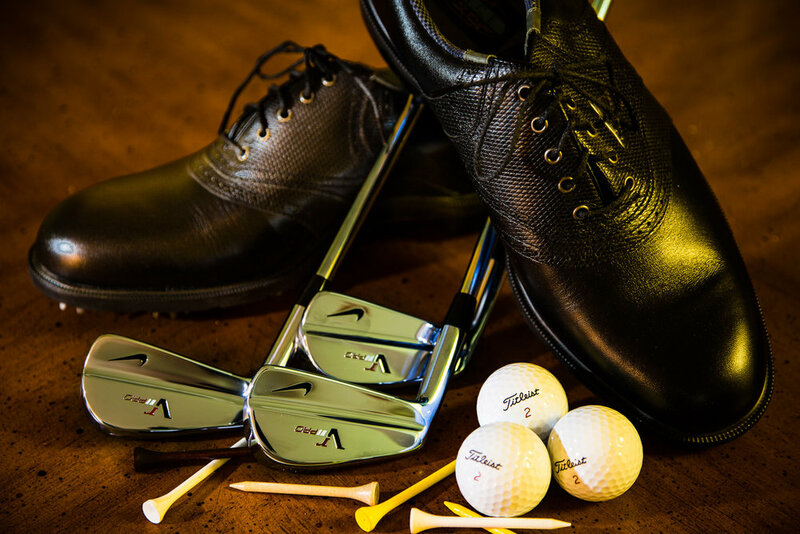 I quickly looked around and decided my dining room table would make the best product table to stage my golf clubs. The wood grain of the dining room table would make a interesting background. By pointing the camera downward at a sharp angle, I was able to use the wood grain of the table top as both the product table and the background. I quickly gathered a couple of clubs from my bag and attempted to arrange them flat on the table.. In a word boring! I needed a more interesting arrangement.. Back to my golf bag I went.. I grabbed some golf balls and tees., and my brand new pair of golf shoes. I took another test shot.. It was getting better, but I needed more.. creative lighting.. I needed a snoot to shape the light.. But getting my snoot from my camera bag would violate the terms of my challenge.. But I really needed a snoot to make the look I wanted.. There I saw my solution. My new golf shoes came in a bright orange cardboard box. Out came the scissors and a little tape, and voila! a snoot! I had one final challenge, how to prop up the golf clubs without being in the scene.. As I scratched my head, there in the corner I saw exactly what I needed, a pair of crutches from a old leg injury. I quickly rearranged the golf clubs and took my shot. Final thoughts.. So with a piece of scrap cardboard, and a pair of old crutches I was able to take a really nice product shot. So don't ever let a lack of gear be a excuse not to shoot. Being inventive allows you to increase your creativity! Newer PostIt's that time again! Time to Fall Back!